I’m back in Quito after more than a month on the road circling Ecuador. From Otavalo and Cotacachi in the north to Guayaquil, Zaruma and Loja along the coast and in the south, to a retreat near Cuenca, I’ve met some wonderful sights and seen some interesting people. Or is it the other way around? Rooming at the SAEX/Quito Clubhouse for the next month, I have set aside this time to review what has transpired and what will come next before I leave this amazing country and move on to Perú. Having 2 months left on my visa I expect to flesh out the 2 big targets on my agenda: the Amazon Basin and the Galapagos Islands. Through connections here at the Club I am negotiating a trip to the Amazon, most likely from the city of Coca. With a population of about 45,000 people, Coca is the staging point for trips to both the Cuyabeno and the Yasuní Reserves and sits at the confluence of the Coca and Napo rivers. The Napo is a major tributary of the Amazon River and was the route taken by Francisco de Orellana when the conquistador made his way east as the first person to cross South America from the Pacific to the Atlantic. You might have seen the movie “Aguirre: Wrath of God” (1972) that was an artistic take-off of the expedition. I’m hoping my trip won’t be quite as surreal! And anyway, Brazil’s pretty expensive, so I’ll skip the Atlantic for now. 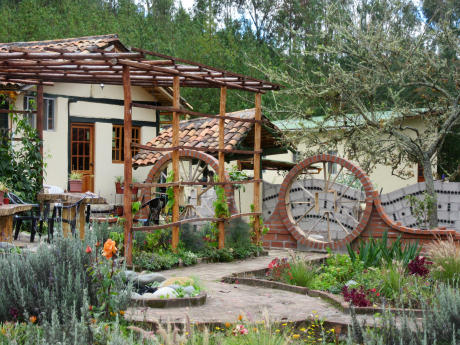 My way back to Quito from Loja included a 12-day retreat near the village of Gualaceo, itself about an hour outside of Cuenca, which I have now visited 4 times. I’d have to say that the road from Loja to Quenca, only a few years old and in beautiful condition, has to be one of the most stunning I have ever traveled, anywhere. 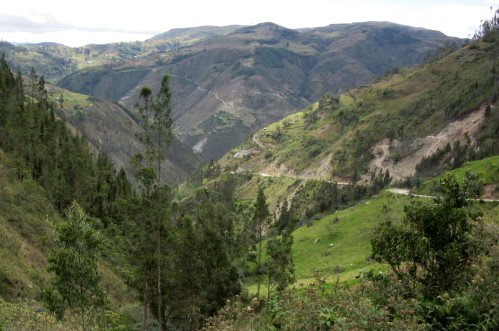 Within minutes of leaving Loja the road begins its love affair with the mountains and canyons separating the 2 colonial cities. This twisting route hugs the cliffs along the way and reveals to the traveler wondrous vistas of mountains, rivers and bottom land, often a thousand feet below the pavement. I’d consider visiting Loja again, just to repeat witnessing the drama along the highway that leads there. After a night in Cuenca I made contact with Javier, the axis of a multi-generational family of taxistas. He drove me and 2 others over another beautiful but rough road to a private 55-acre retreat that we will call Sacred Earth for now. Javier is the person you want to know in Cuenca. He seems to know everyone and every place and will connect each to the other upon request. I enjoyed his company immensely and we’ve since traded several e-mails. We had a great conversation about life on our way to our destination. 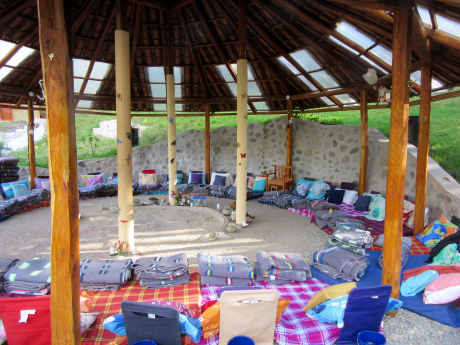 I had reserved a spot at this retreat 2 months earlier and I was eagerly looking forward to repeating my spirit world journeys of April/May while visiting the Shuar. But it was not to be. Just because both retreats each held ayahuasca and san pedro ceremonies, just because both use state-registered shamans, and just because both profess a path to the divine, was no assurance that both would, or could for that matter, deliver the same experience. And this turned out to be the case. In the most charitable of times I might be able, I suppose, to consider the Sacred Earth retreat as a kind of summer camp with ayahuasca. Though we received many pep-talks at Sacred Earth about how we were there for spiritual growth and how Sacred Earth was set up for this “life-transforming” purpose, in fact and in deed this was really not the case. More attention was placed on and directed to Kumbaya-style creature comforts with a little jungle medicine thrown in for authenticity. And very little at that. In nearly 2 weeks of very comfortable living, we attended 4 ceremonies: 2 each of both ayahuasca and san pedro, with a lot of free days in between. In comparison, during the 18 days I spent with the Shuar, the participants attended 16 ceremonies, 11 of which were natem (ayahuasca in the Shuar language), a san pedro ceremony, and 4 other ceremonies relating to the ayahuasca vine that also provided opportunities for spiritual assessment. Each of these 2 very different retreats had set participants back about the same in costs on a per diem basis: about $125/day. In comparison this expense is a 1/2-off bargain to what is available at the new age-y retreat extravaganzas in Perú, where you can also get your hair done and your teeth straightened, with maybe some paragliding thrown in too. But what was delivered by these 2 Ecuadorian retreats differed immensely both in quantity and in quality. Surely let the buyer beware. 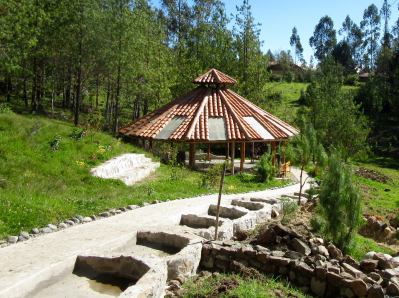 Sacred Earth is truly an ayahuasca beginner’s resort and and it’s really rather more an introduction to the Wonders of South American Spirituality. Compared to the Spartan offerings of the Tsunki retreat, this experience was closer to a Club-Med for your summer vacation. I suppose if I had read more closely between the website lines and asked a few more pertinent questions beforehand I could have detected the difference, but Así es la vida, such is life. What with the 3 full-size hot tubs, a “sauna-ish” room, a media room in the Community Center with an extensive video and music library, wi-fi connectivity and a yoga pavilion, massage and Reiki, we were offered any number of diversions with a high level of creature comfort. Oh, and don’t forget: an ayahuasca ceremony on Tuesday; try not to be late! But don’t fret, because Saturday is a free day and we’ll all hop into vans and go into Cuenca for shopping, ice cream and dinning out at any of the numerous groovy restaurants. During the Shuar ceremonies each participant had an understanding of reverence for the procedure. I don’t remember it ever being discussed as a rule to follow, but for at least an hour before the beginning of each ceremony, as we singly prepared for what we knew would be a long and difficult night, there was little to no talking since each of us was focused on the intent of being there for our personal journeys into the spirit world. Even as a newcomer I understood that this was a sacred undertaking and by no means a trivial jaunt. Silence and contemplation, like the Zen retreats I attended many years before, was a given and an expectation; you just did it. At Sacred Earth however, each lead-up to a ceremony was entirely light-hearted and even when the shaman appeared and began his incantations, his songs and his prayers, the group behaved as if we were taking part in an adult version of a sleep-over; with jokes and silly banter and fluffing the pillows just right; all this sharing was going on back and forth around the circle as the night closed in and the ayahuasca took effect. I was speechless at such a casual approach to what I’ve previously only understood to be regarded as a deeply religious experience. Yet at Sacred Earth we were assured that all was taken care of and everything would be fine, because the tobacco smokers among us would have the option of a smoke-break part way through the night’s proceedings! Sacred indeed. In the past few years, as ayahuasca has become quite well-known in the “developed world,” a division has grown between 2 groups seeking out this indigenous medicine. There are those who recognize the power of the vine and its ability potentially transform one’s life. This group believes that through millennia the people of the Amazon developed their protocols based on keen observations and their integration into the natural world around them, and developed the reverence necessary to realize the full potential of this powerful path. Those who studied these cultures and their approach to the path of self-discovery both accept and welcome the traditional steps necessary for such an experience. As it happened, the majority of the people in my first retreat had been working with the plant for years. A woman from Germany who helped introduce me to protocols during the retreat, believes, by her own calculations, that she has taken ayahuasca about 80 times. Then there is the other group that I can only regard as tourists: people who add the ayahuasca “experience” to their lists as just another must-do, like storming the disco bars down in the Zona Rosa, like buying the perfect trinket for a new setting on the dining room table. These are the ones who race to South America’s natural wonders, grab a selfie, and move on. Sacred Earth fully caters to this second group and is really nothing more than a beginner’s guide to what’s hot and what’s not in natural medicine south of the Equator. It’s really pretty sad as it lowers the drinking of this important medicine to just another thing to do while on vacation. Wait ‘till we tell the guys back home; I should say. Oh, right, I just did. This entry was posted in ayahuasca, Natem and tagged ayahuasca, Cotopaxi, Cuenca, Ecuador, Natem, SAEX, Shuar, spirit world, Zaruma on 2015-08-05 by kmalivuk. So the Sacred Earth ceremonies were psychically (spiritually?) uneventful? Or just something less than you anticipated? What happens when your visa runs out? Back to USA? Honolulu? The Aguirre cd is available by mail from Nflix. No stream. Good to hear from you again. Keep your head up. Tim; Yes to the above. During the first ayahuasca ceremony for example, I would receive the visions/illusions/hallucinations. And the shamans universally remind us that these are diversionary, so I would bid the light shows “hello and goodbye” but then someone in the group would crack a joke. Then another person in the circle would laugh, and a 3rd person in another part of the circle would fire off a rejoinder. Each time I’d have to go through the illusion-banishing process all over so that I might finally get to work and journey through the spirit world. But I’d never quite get there since these folks were more interested in bonding with each other than really getting down to address some fundamental issues. All in all, very disappointing. I wasn’t at the retreat for fellowship and therefore the odd man out. Though there were other older participants, it seems as though they had never lived through the psychedelic 60’s like we did and so they too were seduced by the pretty colors rather than wanting to go beyond. When the visa runs out, October, then Lima, Peru. I’ve already made an initial contact with the SAEX Clubhouse there for a room to rent. I expect that I’ll spend time in the capital like I’ve been doing here in Quito. And you? I hear that you’ve been participating in some mindfulness processes yourself. Cindy’s kept me informed. Good news. Yup. Thanks to nearly simultaneous suggestions from Cindy and my shrink to consider Full Catastrophe Living I have been lately following Zinn’s version of Vipassana and there have been some copulating delightful moments along the way (I’m trying to decoarsen my speech). Sometimes nonplussed by paradoxes within the teaching…..I mean if nothing is good or bad and we’re not striving to accomplish anything what’s the copulating point? Copulate if I know. A Full Catastrophe Living would seem to me a call to approach each day as if it were the last; and therefore the best. Meaning that much (most?) of what we do, we do from habit. But should one be living on auto-pilot, where lack of focus is built in to our lives? Relating to something, or even worse someone, the way we always have just because we always have is not really living and it also is a dis-service to ourselves and those around us. Before going south I was digging myself a very deep hole because of “going through the motions.” I was essentially operating on idle, waiting for each day to end in hopes that tomorrow might somehow be better. But how could it have been since I was constantly setting myself up for repetitive failure for an endless string of tomorrows? And it was making me physically sick. Now, though I am far from attaining the ideal and ego still gets in the way too often, I do take each day as a day of discovery and truly enjoy the opportunity as it unfolds. I do not and cannot predict how each day reveals itself, but it precludes losing myself in distractions. That’s not to say that everyone should run off to Ecuador (please don’t, it’s a small country! ), but for me it’s worked better than I had hoped. And the better choice, with bigger rewards, would be to plug that in to where you are. Ram Das’s “Be Here Now!” Though like you, what do I know? Perhaps approach each moment as it were the last and the best is more apt. I’m guessing you are familiar with the practice: focus on something present, usually but not necessarily the breath, and at the same time notice one by one the stream of thoughts the monkey mind provides to distract your focus. Ram Dass, DeMello, Eck Tolle, K-Zinn, et al seem to be talking about this same process. Zinn’s take on it is working for me. Hope it doesn’t end up the latest item on my list of dilettante dreams deferred. Found out Jon Kabat became Kabat-Zinnn when he married Myla Zinn the daughter of progressive historian Howard Zinn. For someone I’ve not met I’m really fond of this guy. Howzit? Not only does Ecuador score highly on these scales, but just this week the “Economist” rated Quito as one of the most desirable cities in the world to live in. But I’ve been telling you that for a while, no? I just got back from 5 days in Amazonia and had the most wonderful time. I’m (slowly) getting together a post about the experience while I’m nailing down my last goal for the country: the Galapagos. As always, the best to you and the yoga class. Marilyn; I’m always impressed at how universally informed you are. Thanks for being so because it keeps me on my toes! Correa is nothing if not an enigma. There can be no doubt that he has raised more people, especially the large indigenous population, out of poverty and brought, some say more than a million people, into the middle class. And yet it is the middle class, even more than the privileged who are now solidly against him. And they have strong reasons for feeling so. Just one example, removing the federal contribution of 40% to social security, has galvanized huge numbers of opponents. And there are many other issues just as dramatic which have moved his approval numbers downward. So while overall quality of life has markedly gone up, many feel that he has mortgaged the future of the country to achieve results now. Thanks to you and Marilyn for shedding some light on the political situation there. When you mentioned the work stoppages recently I looked for info via google and from that gathered that estate tax increases motivated the strikers as I found no mention of any other issues. I was wondering exactly who other than plutocrats would withhold labor and service over this issue. Now I’m wondering how Correa the Bolivarian came to this position vis a vis social security. Friedman is smiling in his grave. I’ve bookmarked Counterpunch (altho they did not mention the SS issue). Any other good infosites you would recommend Marilyn? Looking forward to Galapagos post(s). Once again you are rendering fantasy real. Thanks for these referrals Marilyn.